Lately I’ve been reading about a “new breakthrough” in the field of Artificial Intelligence, that is Sophia the robot. I also heard so much in the online media about this Sophia as I do think that as an expert in Artificial Intelligence and Machine Learning, I need to put matters in the right perspective so that the public could have an objective picture clear of bias and exaggerations. Sophia is a humanoid robot build by Hanson Robotics Limited, a robotics company in Hong Kong. Sophia is described as their most advanced robotic creation. Experts have created a robot that could form human relationships.. Besides, this Sophia is actually ‘Miss Sophia’ because it has the attributes of a lady, by appearance. For me all of these is more amusing than interesting because it tends to shield people from the underlying fact: that this Sophia is a piece of machine, pieces of metals and other stuff put together. First, I would like to appreciate the efforts Hanson Robotics Limited for the research effort put in to create Sophia as well as the founder of Hanson Robotics, Dr. David Franklin Hanson. Good job to them and the team. However, I would like to point out that the so much vibe about this Sophia could actually give the naive public the wrong impression about the “abilities” of this robot. 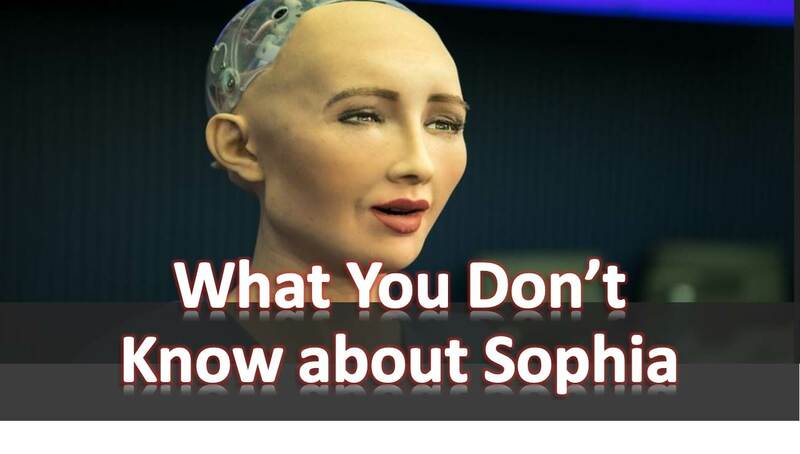 This Sophia is just another robot, a social robot, not so social anyway because it simply cannot exhibit the many human attributes ascribed to it in the media. Think of this: if you watch the interview and the videos on Sophia, how many times have you see Sophia walk up the stage on its own? or enter a car on its own? or even move freely through an audience on its own? And these are even some of the most elementary things humans do. Can this Sophia work without connecting to an information processing service somewhere? Could it decide on what to do and where to go on its own? Can it find its way back it Hanson Labs on its own, say with public transportation? It it self-aware of its environment? What if the Hanson team forget to take it back to the car after a particular program? Can it dress itself up? By the way, why do they dress it up as a woman? Does it even give reasonable answers to questions? You can make up so many of such question. Sow why all the publicity about this Sophia? What is so significant about this robot that everywhere you turn, you here of Sophia? Clearly, this Sophia is just another robot, a piece of machine that tends to mimic human way of doing things and we need to stop barraging the public with all this over-bloated details about a machine having human personalities. What do they want to achieve by all the noise and publicity? Advertise the company? Draw attention to the designers? or just tell people what they want to hear? Or solicit for more acceptance and support for research on AI? I don’t get it! For me the so much noise is not necessary and its very much uncalled for. For now, the technology we have could not create any machine that could have information processing abilities close to 0.0001% that of an average human. I could tell you that. So much resources and effort have been put to move this Sophia to different locations, conduct seminars etc. All these effort could be put into something more meaningful. Granted, it may have more features than other robots, but frankly speaking it it just another robot. So if every organization that produces humanoids engages in this kind of publicity, then we would be spending more time talking and causing much distraction than learning or developing something new. From my own personal findings, the complexity of the generality of human behavior is beyond the comprehension of contemporary scientists and researchers. Sophia is just a piece of machine and we should avoid ‘overpersonifying’ it. Effort put in publicizing could be channels to do something a little more useful to the society. This is my personal view and I would like to thank you for reading. ← What is K-Means in Clustering in Machine Learning?